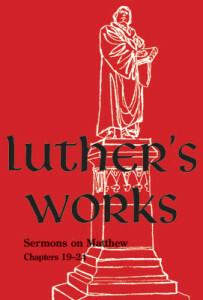 To commemorate the upcoming Reformation observance, and to celebrate the release of the newest volume of Luther’s Works, we are pleased to offer one lucky winner a free copy of Luther’s Works, vol. 68: Sermons on Matthew 19–24. Tell us your favorite Luther quote! Tag @CPHAcademic and use the hashtag #LuthersWorks. All tweets must be received by Tuesday, October 21 (by 11:59 p.m. Central Daylight Saving Time). Fine print: A winner will be chosen at random and notified via Direct Message on Twitter. If the winner fails to respond in three days, a new winner will be chosen. The winner will be sent an affidavit of eligibility by email. One entry per person. Must be 18 years or older, and a resident of the United States. Concordia Publishing House is not responsible for lost, late, or damaged entries. Prize worth approximately $54.99. See complete rules Here.